Though warned early in her career against pursuing a path as a portrait painter or becoming a mother, Mary Sauer has chosen to do both, persevering and following her dreams, no matter the resistance she finds along the way. Her dedication has paid off with her second baby and her second solo exhibition arriving within a month of each other. Born and raised in the outskirts of Hanson, Kentucky, Sauer spent her childhood in a rural, family-centered setting, far away from any major art centers. Her rambunctious brothers liked to play a bit rough, so when Sauer needed a break, she picked up drawing as a way to pass the time. Despite lacking opportunities for formalized art training in her home state, Sauer’s fascination with portraiture was already apparent in her childhood. “I always loved drawing people. When I was in elementary school, I would rush to finish [school work] so I could spend the extra time drawing my classmates.” When Sauer was in third grade she won a local art competition and became something of a celebrity artist in her school to the point that other kids would pay her their lunch money for portraits. Her classical education at BYU offered Sauer many benefits, but it also didn’t entirely meet her needs. Illustration is geared toward bringing written texts to life and creating images to supplement what cannot be explained by words. Sauer saw her art as first and foremost a story on its own, not a depiction of a text. Her paintings are an exploration of human life more than a depiction of it, the original narrative rather than a visual supplement. “The whole time I was in the illustration program, I wasn’t really interested in illustration,” Sauer says. “I was interested in painting people and creating narratives.” She decided her interest lay mostly in portraiture, interesting architectural spaces, and emotional expression rather than illustrating a written concept. Just as she had in elementary school, Sauer began to design her own curriculum of sorts, focusing on portraiture and realistic depictions for the duration of her education. 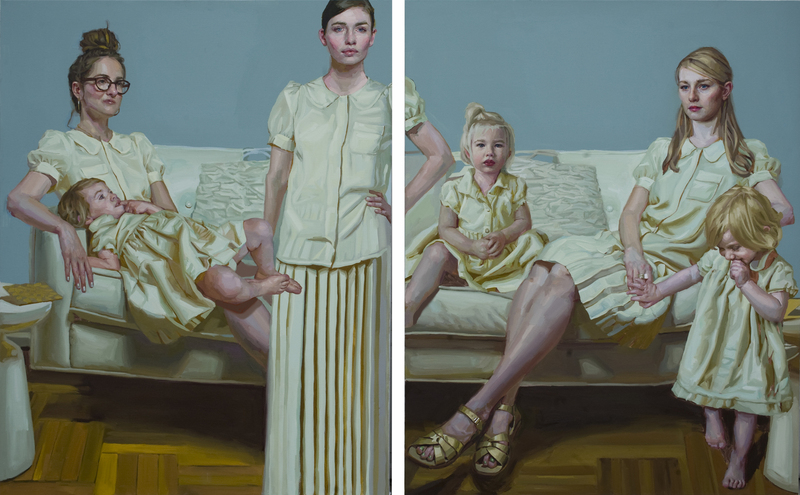 “Contemporary Motherhood,” 2014, oil on canvas, 60″ x 96″. Sauer’s march toward portraiture did not go unnoticed by her professors. The more Sauer pursued portraiture, the more opposition she met. “My professors would sit me down and say, ‘You know, you can’t make a living as a portrait painter.’ That made me kind of mad. I was determined.” One professor, however, empathized with Sauer. Professor Robert Barrett became a mentor to her. He organized a special opportunity for Sauer to attend the Portrait Society of America’s annual conference. “I was thrilled to meet more portrait artists. In the university setting, it’s like they try to stamp [us] out,” she says. It was at this conference that Sauer first saw the work of Cecilia Beaux, a portrait painter contemporary to John Singer Sargent, and absolutely fell in love with her work. “There’s a painting of a girl in a white dress with a yellow bow that I thought was so incredible. Cecilia Beaux’s work really inspires a lot of my style.” Beaux’s painting, “A Little Girl (Fanny Travis Cochran)” (1887) has a Velazquez-like quality in the serious expression of the child, brilliantly layered colors, and thick brushstrokes, epitomizing the turn of the century portrait style made famous by John Singer Sargent and Joaquin Sorolla. 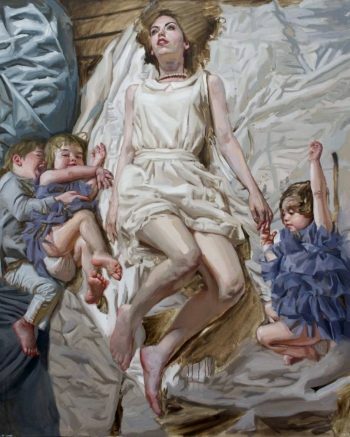 Also influential during her undergraduate education was Sauer’s referral to William Whitaker, a figurative artist who painted several portraits for the leaders of the LDS church and was known colloquially as the “granddaddy of Utah artists.” Whitaker gladly accepted several artists, Sauer included, into his studio as student interns. During her internship, Whitaker advised Sauer on other educational opportunities she could pursue as a portrait painter and Sauer and her husband, David Sauer, moved to New York where she took classes at the Art Students League and Grand Central Academy. During that time, her professors’ warnings proved correct and, unable to secure enough work as a portrait painter, Sauer became a studio painter for the infamous pop artist Jeff Koons. Deciding whether the children in this piece are meant to be real or imagined for the woman seems unnecessary to appreciating this work. The proudest moment of Sauer’s time working there was when Koons called her by name. “I worked for him for about 2 1/2 years. You had to work there a little bit longer for him to really get to know you, there were so many artists that would come and go. At first he called me ‘that dark-haired girl’, but once he called me ‘Mary’ and people were like ‘Wow!’” she chuckles. “I have so much respect for him. Here he was, a brilliant man and he was willing to employ about 150 artists, mostly representational, in his studio so they could have a living, paid vacation, and benefits. It can be hard to find work in New York as an artist sometimes, so I thought that was really great.” Koons’ studio was located in the heart of the gallery district in Chelsea, so after work, Sauer would often attend gallery openings with her co-workers. Though Sauer loved her time in New York, when she decided to get her MFA it just wasn’t financially possible to do in the big city. “My husband is an opera singer and also wanted to get a graduate degree in opera and between the cost of two graduate school tuitions, it was just too much,” she explains. They both applied to the University of Utah and received scholarships, making the choice to return west an easy one. In “A Little Bit of Everything,” the artist uses herself as a model in a wistful portrait that seems to question if there is room for everything one wants in one’s life. Sauer expresses a lot of gratitude for this decision, saying that coming back to Utah was great both because of her educational opportunities but also for the option to grow her family. “Not many of the female professors I had in my studies had children, nor my co-workers when I was working for Jeff Koons,” she says. “But I always wanted to have kids.” Her parents and brothers also have moved to Utah, and have helped her balance her professional and personal lives, “to be a painter and a mom.” Despite multiple people insisting that she would not be able to paint as much or give attention to her artwork as a mother, Sauer has been an incredibly prolific and dedicated artist. Both of her solo exhibitions have been completed while she was pregnant with her two beautiful daughters, the youngest born just last month. Her oldest, Scarlett, has already been featured as a subject in Sauer’s paintings at the tender age of 3, and Sauer is excited to do dual portraits with both her girls when they are older. Sauer’s young family is deepening their Utah roots with the purchase of a Victorian-era house in Utah County. The move has been extremely stressful on top of her pregnancy and her husband’s extended work absence (he has been performing along the East Coast), but Sauer feels the house will be more than worth it. “I’m so intrigued by the spaces in this old house. I think it will be featured a lot in my future work,” she says. 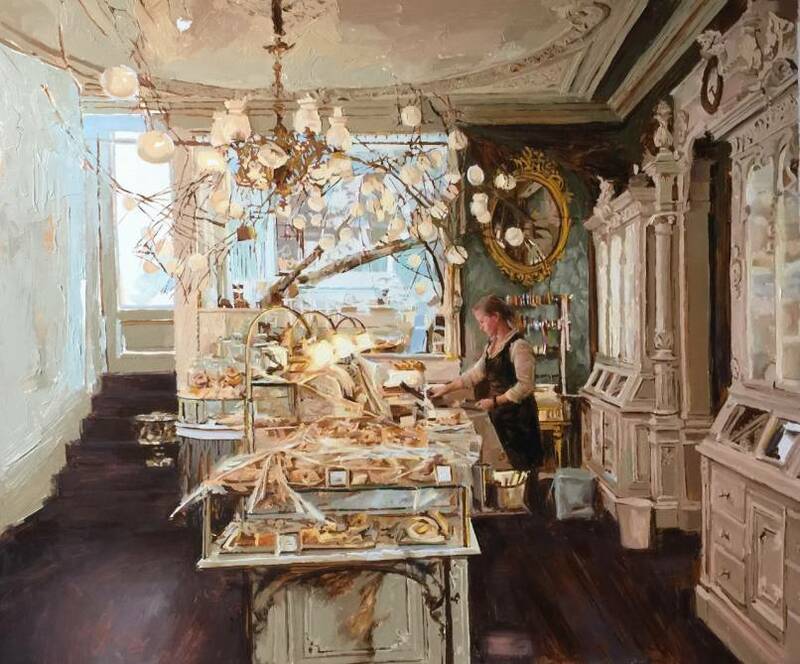 Though this painting retains a figure, in works like “The Chocolate Shop,” multi-textured interiors seem to become the focus of Sauer’s work. Sauer’s portraits are far from simple order taking. She studies her subjects carefully, using the background and props as part of the narrative structure, a technique inspired by European royal portraits. “I love the Gainsborough portraits — women outside in all their finery with the wild, English landscape behind them,” she says. “I pose and light the figure to tell a story with the portrait. 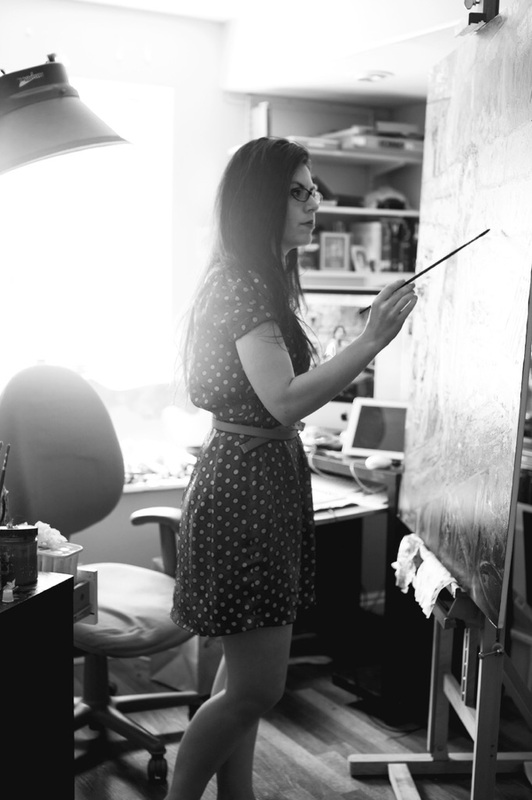 Portraits are like a stage; none of the clients want to be painted unflatteringly. It kind of reminds me of social media, we only want people to look at us from the best angle.” Most of the time, Sauer continues, the portraits end up not being about the client at all, but feel instead like a portrait of Sauer herself. 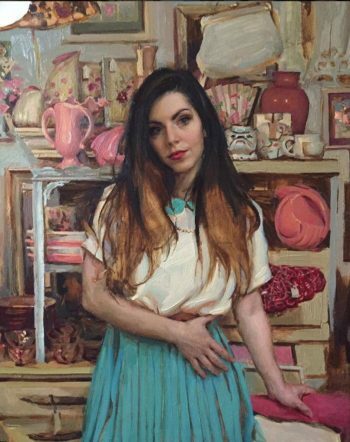 “Anna in White Shop,” 35″ x 26″. Her most familiar avatar is Anna, a model friend she met in New York. When Sauer and Anna are out on the streets, people often ask if they are sisters. Sauer said that often her paintings of Anna are actually thought to be self-portraits, which she finds very flattering. “For me, Anna represents my ultimate avatar. If I could have designed myself I would probably look a little more like Anna,” she laughs. Sauer’s portrait “Anna in White Shop” speaks to this idea of expectations vs. reality, avatar vs. creator. 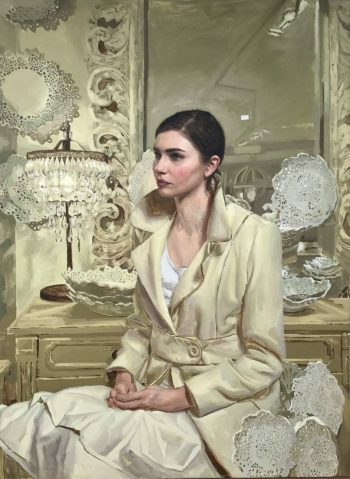 Anna sits uncomfortably in a pristine cream-colored coat surrounded by delicate white dishes that look as if they will be crushed if she makes the slightest movement. She is surrounded by intricate objects, expensive, but also crowded. Anna is confined, trapped by perfection, unable to move for risk of shattering her world. Sauer’s work is a poignant, feminist statement about accepting womanhood, sisterhood, and motherhood in oneself and in others. By seeking out and creating her own opportunities she was able to succeed when many told her she would fail. Her determination is evident in the powerful brushstrokes of her canvas and quietly defiant expressions of her subjects. Continuing a long tradition of American portraiture, Sauer has found the field not only a viable area of study, but also a powerful means to communicate narrative and share experiences. Remnants, work by Mary Sauer, Meyer Gallery, Park City, through Aug. 8.